This brown, little hairy egg-shaped fruit doesn’t look very promising from the outside. But believe me, don’t go by the exterior! Once you dig in, you will be introduced to a world of juicy delight! Kiwifruit, or kiwi, is a tangy, watery, soft, and fleshy fruit that adds a unique twist to your salads, salsa, smoothies, and face packs. Wait! What? Face packs? Don’t be so surprised! This seemingly humble looking fruit has immense benefits for your skin. 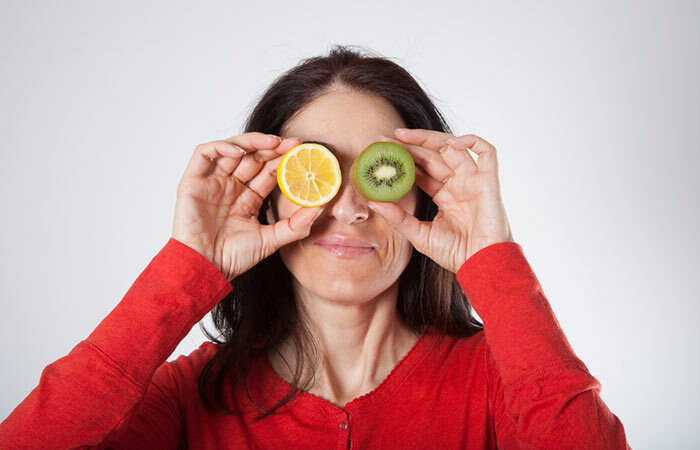 Read on to find out all about a kiwi fruit face mask. 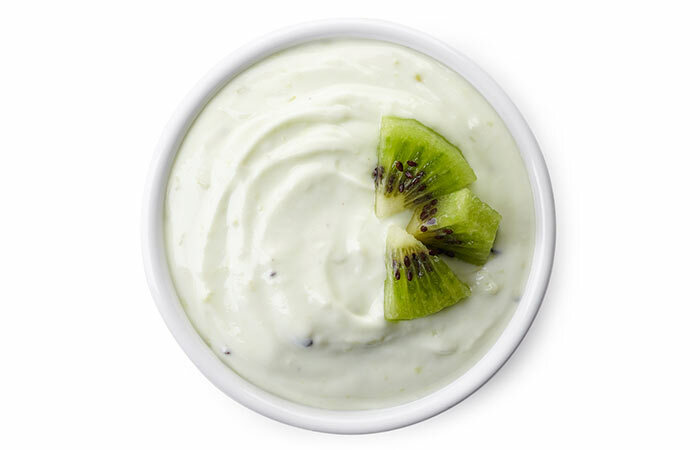 Kiwi is jam-packed with Vitamin C and phytochemicals along with vitamin E, carotenoids, and phenolics. 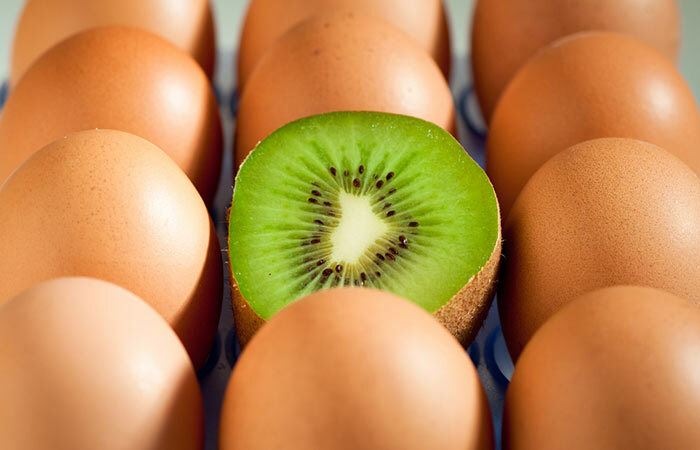 Kiwi is an excellent source of antioxidants that protect your cells from oxidative exposure and rejuvenate them (1). Collagen is the compound that helps maintain your skin’s elasticity. Also, it keeps your skin soft and supple and prevents dryness. 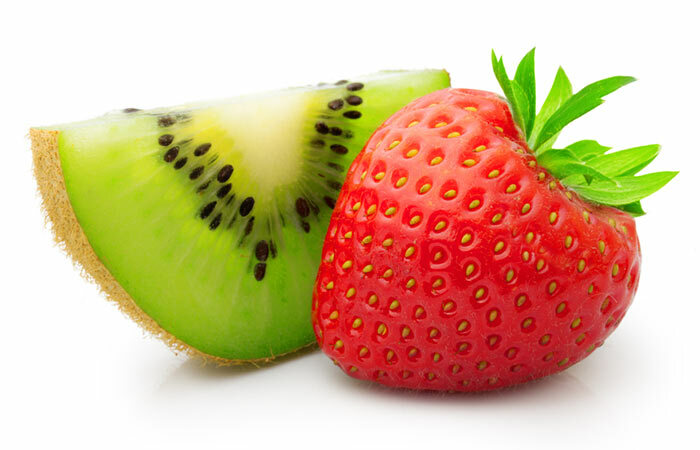 Vitamin C contained in Kiwi supports the collagen density in your skin (2). 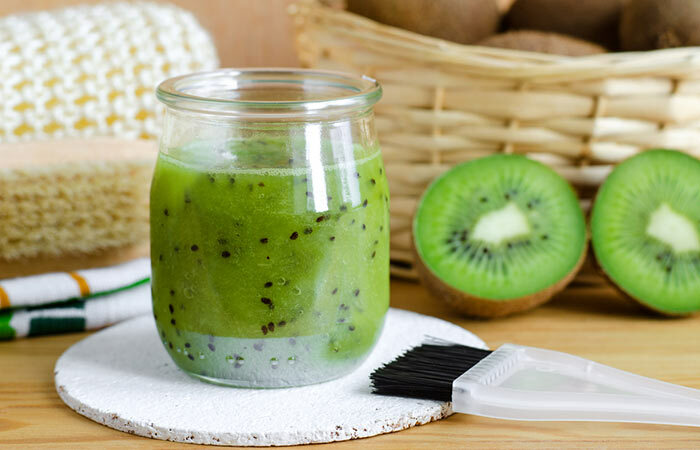 Kiwi has anti-inflammatory properties, and that’s why it prevents acne, rashes, and other inflammations (3). It’s a nutrient-dense super fruit. Now, here are the ways you can include this magic fruit in your daily skin care routine. This face pack is extremely refreshing. It tones your skin, hydrates it, and unclogs the pores, giving it a fresh appearance. You can immediately see the difference after washing it off. This face mask helps in minimizing your pores and blemishes as lemon juice is an excellent bleach. This face pack is best suited for those with oily skin. Mash the kiwi pulp in a bowl. Add the sandalwood powder and Fuller’s Earth and mix well. Add some water in case the consistency is too thick. Sandalwood helps in removing tan and is excellent for removing acne, pimple, and blemishes. Fuller’s earth tones your skin and unclogs the pores while kiwi keeps it hydrated. Mash the kiwi and strawberry to form a smooth paste. Add the sandalwood powder and blend. You may add a teaspoon of water if the consistency is too thick. Apply it evenly on your face and leave it for 15-20 minutes. With regular use, this face pack cleanses your skin thoroughly and fights acne and pimple-causing bacteria. It brightens your face and adds a natural glow to it. Mash the kiwi pulp and squeeze the juice out. In a bowl, mix olive oil and the kiwi juice and blend. Massage the mixture on your face for 5 minutes using strokes upward and in a circular motion. Let your skin soak it in for 20-30 minutes, then wash it off with warm water. Olive oil and kiwi juice contain antioxidants that rejuvenate the skin cells. Also, massaging it on your face promotes blood circulation and energizes the skin cells, bringing a glow to your face. I know that you can’t wait to try these face packs at home, but I have some pro-tips for you that will help you get better results. Check them out. Before you even start, check whether your skin is allergic to kiwi or not. Rub a small part of the fruit on the inner part of your elbow to see if your skin can tolerate the fruit. Before you apply any of the packs, remove all traces of makeup and steam your face. In case you don’t have the time to take steam, just splash warm water on your skin and pat it dry. This opens up the pores and lets your skin soak in all the goodness of the face packs. In case you have excess face pack left in your bowl, store it in the fridge. But remember to use it within a couple of days. 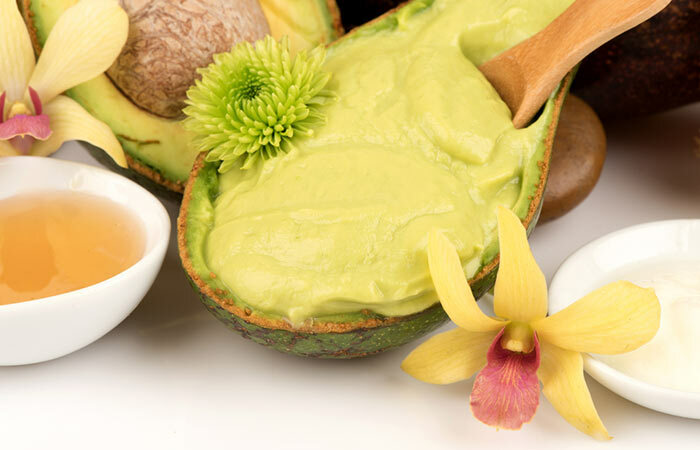 Pamper your skin with these DIY natural kiwi-based face packs. You will absolutely love this. 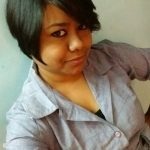 Do let me know which of these are your favorites. And if you want to share some recipes, drop in your comment right below!